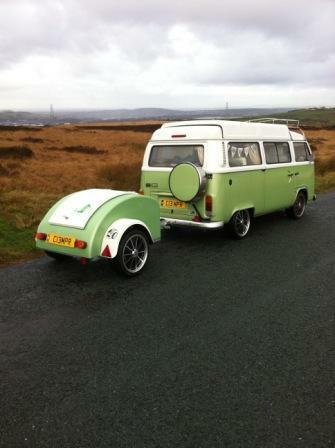 Alison and I went to Bury to order a Dbeilt trailer to match Absinthe. As a suprise I'd booked us a meal at the Parkers Arms at Newton by Bowland on Twitter and had been told we could pitch the C13MPR in the car park to sleep overnight. I'd arranged for Jo & Si to stop over as well and Lins & David were coming as well. On the way from Bury, Alison said she fancied a brew so I decided we'd pull over into a picnic car park, where I could walk Boris and she could put the kettle on. It was about 4.00 on a Saturday afternoon and there weren't many cars in either of the two car parks. Things started to change however when dusk started to fall. A succession of cars started arriving and driving between the two car parks. They must have thought all their birthdays had come at once wehen we turned up with Absinthe - a double bed and tea on the side! The atmosphere was very strange and we decided to move on, thanking goodness that we hadn't planned to sleep the night there!